I enjoy watching episodes of “Uncommon Threads” – They have many interesting guests with creative projects. 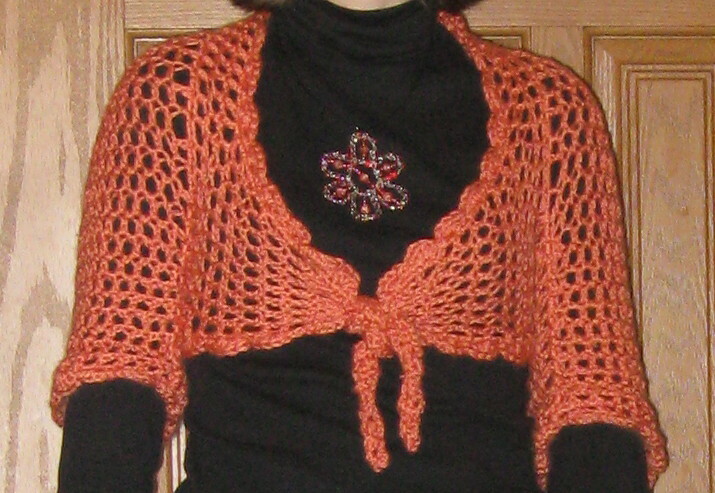 One week they had a woman demonstrate how to make a shrug very simply and she included several variations on the basic pattern. I used her idea and created my own design in a child size version for one of my daughters – it turned out so well that I tried one in my size shown here. It works up very quickly since I used a large hook (M) which gives the garment a nice drape and regular 4-ply worsted weight yarn (Caron -Simply Soft – also washes very well). For my returning students we will also be working on this project this week. Knit and Crochet Show - next week! Christmas Gift Designs in Crochet Today! Hi I have only just found your site when looking how to crochet Celtic symbols. I want to crochet one to go on a bag I am doing for my son's fiancee and thought the simple three point design would be a good start. I have tried myself, without a pattern, some interlocking circles but am not sure how to do the points at the ends. Any help would be appreciated. I have now bookmarked your site and shall be looking with interest. PS: I really love the blue square knot necklace but that would be too difficult for me as a start. Welcome! Thank you for your comments and feedback. I plan to be posting some patterns over the next few months and one would be a Trinity Knot Pattern. As for the points at the tips, you have probably figured out something by now – so sorry for the delay in posting back to you – but my idea would be to either use a picot (ch 3, sl st) or sew the ends into a point using matching yarn and a yarn needle through the back.